Pomegranate has long been regarded as a super food, but pomegranate beauty products can also work well for your skin. They've been used throughout history, even by the ancients, and have been considered a symbol of prosperity and abundance in many cultures. Nowadays, you can buy several different skincare products with pomegranate to help keep your skin clear and fresh. Pomegranate beauty products, especially for the skin, are jam packed with antioxidants and vitamins. It has around three times the amount of antioxidants as green tea - which is scentifically proven to cleanse the body. Various studies suggest that pomegranate, in the force of a juice or food, also help support the immune system, promoting blood circulation. Cell regeneration: Pomegranate helps product the outer layer of your skin and helps the inner layer repair itself, aiding in tissue repair and healing wounds. 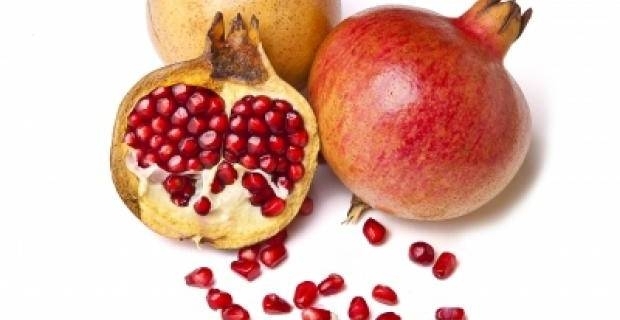 Anti-aging: The qualities in pomegranate products reduce sunspots, wrinkling and fine lines, also reducing hyperpigmentation which contributes to aging skin. Sun protection:The compounds in pomegranate help protect the outer layer of your skin from free radicals damage, reducing sunburn and helps prevent skin cancer. Youthful skin By smoothing the skin along with its anti-aging properties, pomegranate helps encourage smoother, youthful looking skin if used as a moisturizer daily. Dry skin: The small molecular structure of pomegranate help it penetrate into deep layers of the skin, combating certain dry skin conditions and helping to soothe irritated skin. Whenever you purchase pomegranate beauty products you should always talk to your doctor first, especially if you suffer from a skin condition. Although much of the benefits for pomegranate has been scientifically proven, they are available over the counter and may not be ideal for certain skin conditions, such as ezcema.